Ever wonder what life’s all about? (1) What do women talk about when there are no men around? (2) What do men say to one another when there are no women in sight? (3) How on earth did George W. Bush win, not once, but twice? Applying the ancient Chinese/Tibetan practice of Feng Shui to these and other pressing questions facing an anxious humanity, Mayfield & Morse touch upon subjects ranging from careers (you do have one, don’t you?) to relationships (you do have one, don’t you?). From family & ancestors (does it really matter that your aunt Dorothy was Dwight D. Eisenhower’s second cousin’s great-niece?) to fame (you do have some, don’t you?). While they may not agree on every tiny teensy little detail of how to lead a relatively happy life (one of them is, after all a woman, the other happens to be a man; even more ominously, they’re married), between the two of them there’s more than enough wit and wisdom to go around. Candidly drawing on their personal experiences, including a collective 64 years of married life, countless affairs (often with strange and exotic people), countless jobs (often in strange and exotic locales), the experience of raising three children, spoiling two grandchildren, and moving to and surviving in a village of 1,000 souls, Mayfield & Morse will leave you laughing and wondering where the 90 minutes went. Janet Mayfield is a Kaslo-based Feng Shui consultant, and a professional organizer. A former Edmonton Female Entrepreneur of the Year award-winner, Mayfield has wowed crowds across Western Canada with her often blunt, disarmingly honest and open speaking style. She is currently working on Do One Brave Thing a Day, her first book. 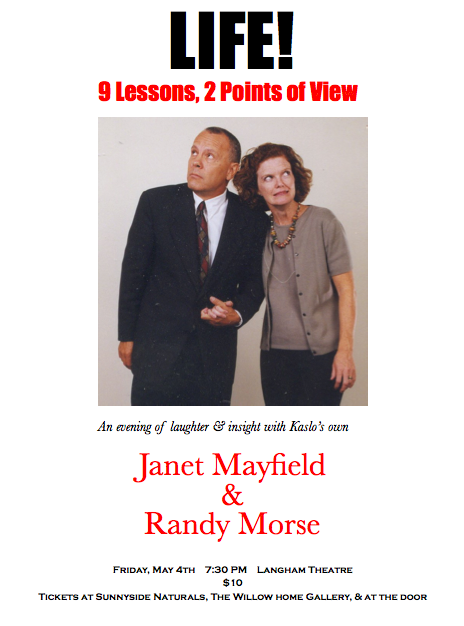 For more on Mayfield, visit www.janetlynnmayfield.com. Randy Morse is a publisher, artist, songwriter, and author (his seventh book, Man Up in Ten Lessons, officially launches in May 2012). Morse has lived and worked in the U.S., Canada, Europe, Latin America, and China. The recipient of numerous awards, scholarships and fellowships, he has performed before intimate gatherings and thousands of spectators. For more on Morse, visit www.rgmorse.com. Next Good Health — here’s to yours!
. Hey, it could be worse! Our PM could be Goofy….uh… wait a minute…maybe that’s who we got, already: Goofy in an expensive suit and a fine toupee. Now see, that’s the kind of complete exaggeration that discredits our illustrious PM’s opponents. Anyone with half an ounce of sattorial smarts can see that Steve’s suits are sourced from Mister Big & Tall, or Moore’s (two for the price of one), or (most likely) both. There are no natural fibres in a Harper suit; they are made entirely from synthetics, mainly derived from tar sands-sourced bitumen (ditto, btw, his shirts and ties — just look at the shine on those bad boys!). If the Prime Minister were to stand too close to an open flame — WHOOSH — time for a byelection, baby! “Goofy”? Absolutely. But “expensive”? Come on. Who in their right mind would vote for someone willing to pay good money for suits like THAT? I mean, Mary Sue, REALLY! Next: Stephen Harper’s hair: the real story. I’ve heard that Harper’s hair is actually a rug made from badger interlaced with coyote. Inside the toupee (stuck on with a fresh Albertan cow pie) is a transmitter which brings signals from the Koch Bros. into Harper’s brain. Those Oily Barons recently bought the Fraser Instapuke… or maybe it was just a renewal “donation” to ensure the FI’s continued pro-American corporate-sided ‘thinking’ and its fine public manipulation by scientific studies done by gynocologists in the FI bar. What with the Boston Tea Party and the present unpleasant lot of teabaggers like the Koch Bros, I believe that Americans cannot be trusted with such a fine beverage as tea, So, being a tea-aholic, I don’t go to the States–even though their customs officers apparently feel you up close and VERY personal..